Read the previous part of this blog entry in Aguacatal road. After a little more walking, with a dense patch of coffee plants to our left, we came upon a wall to our left, and a T-junction in front of us. I decided that we would go to the right, into the direction of San Marcos de León. Black-bordered Crescent (Tegosa anieta luka). While still a dirt road, this road was much broader and also more open to the right side. After some walking I spotted many pieces of stone and other rubble. When I lifted a flat piece of stone I saw two toads: one large one, and one huge one; most likely Marine Toads (Bufo Marinus). I called Alice to come over, and she exclaimed "rana", which is Spanish for frog. I corrected her by saying "toad", and she repeated it! 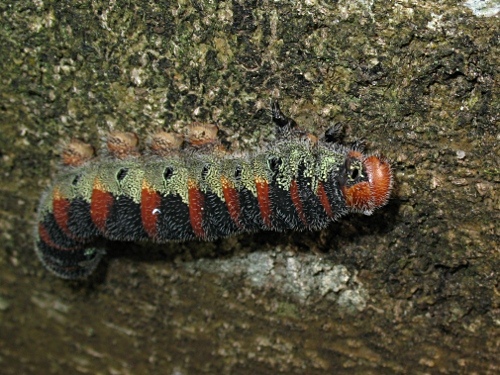 A large caterpillar on a tree trunk. We continued our walk and soon had the feeling we were back in the forest again. Esme spotted a large caterpillar on a tree trunk to our left, so I took photos of it. She said: "look how it looks like it's wearing boots". 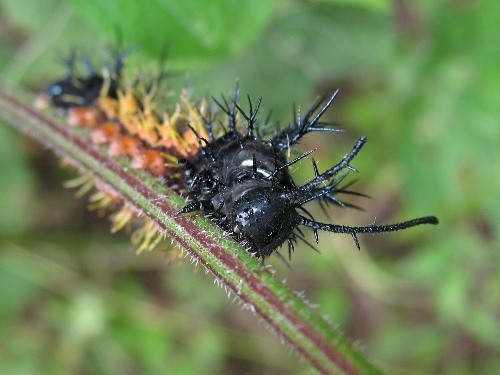 And indeed the caterpillar's midabdominal prolegs do in a way resemble boots. Two-barred Flasher (Astraptes "fulgerator azul", Reakirt 1867, complex) resting on a coffee plant leaf. We kept walking to the left of the dirt road, and while I was trying to take a picture of a cracker, that flew away before I could even press the shutter button, Esme called me over. 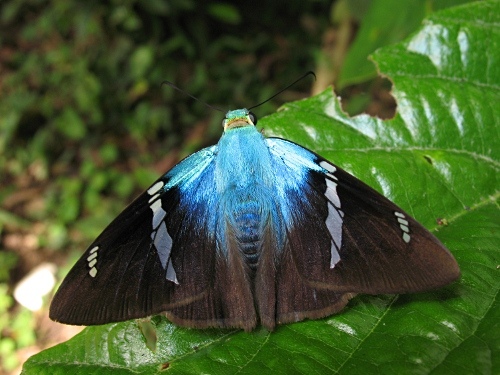 She had spotted a beautiful flasher resting on the leaf of a coffee plant. I carefully moved close, took a photo, moved closer, and took another photo. I kept repeating this until I was quite close, and scared away the flasher, which belongs to the Astraptes "fulgerator azul" complex, which most likely consist of several species. It landed on another leaf, and I was able to take several more photos. 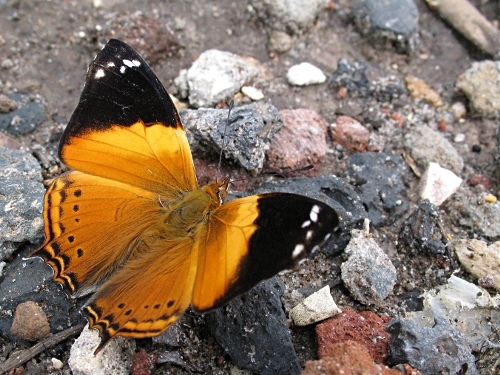 After a few minutes of walking we came upon a large muddy patch in the road, which had attracted a lot of butterflies. A bit further down, to the left of the road was a large tree with an exposed root, a perfect seat for having a break. Esme had spotted a metallic blue small butterfly, so while she was nursing Alice, I tried to take several photos of this butterfly, a male Mexican Sailor (Dynamine postverta mexicana). 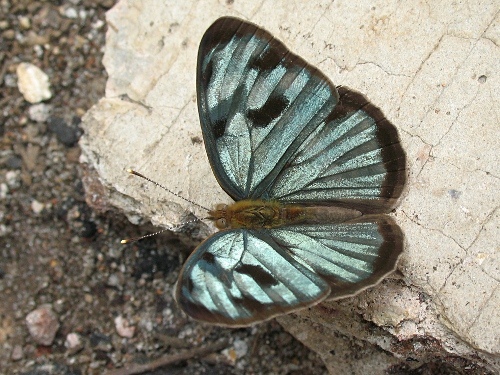 Mexican Sailor (Dynamine postverta mexicana, d'Almeida, 1952), male, dorsal. Taking photos of this small butterfly turned out not to be an easy task. It was very hard to get even near it. And since I wanted both a picture of the top of the wings (dorsal), and the underside (ventral) it took quite some patience. Then it landed on a piece of unatractive yellow plastic, and I managed to get a reasonable picture showing the underside of the male Mexican sailor. 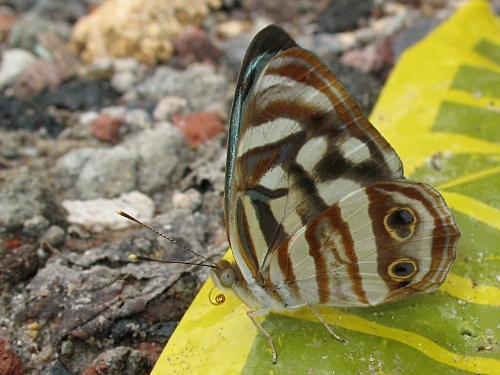 Mexican Sailor (Dynamine postverta mexicana, d'Almeida, 1952), male, ventral. After some more photos of the Mexican sailor I joined Esme and Alice, and sat on the tree root as well; there was plenty of space. I drank some water, and Esme and I observed the many butterflies that were attracted to the muddy spot. 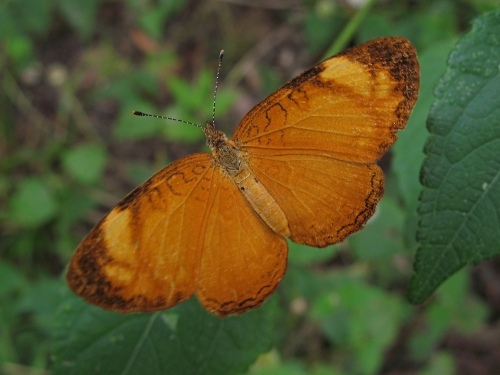 I saw two Godman's Mapwings (Hypanartia godmanii) and decided to take a few photos of this species. 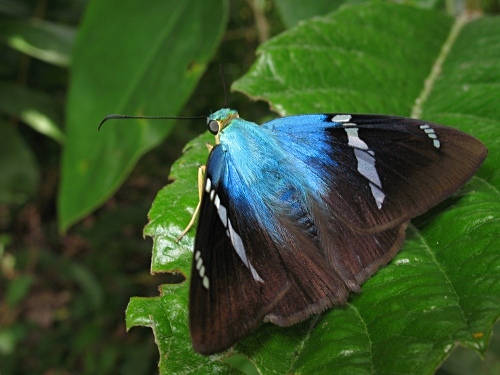 I only recently had learned to identify this butterfly. After a few photos my camera suddenly made a beeping sound I had never heard before, and in the display it reported that the memory card was full. Normally I have at least one spare SD memory card with me, but this morning I decided not to take spare batteries and not a spare card with me. I had just charged the batteries, and thought I had also plenty of space on the memory card. Turned out I was wrong regarding the latter. 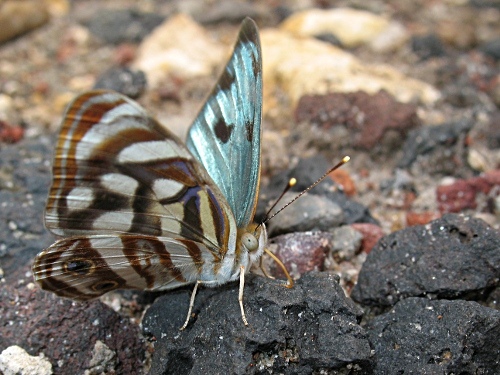 Godman's mapwing (Hypanartia godmanii), dorsal. Since there was no point in going back to fetch a memory card I decided to delete a few photos that were not focused correctly, and we continued our walk. To the left of the road we noticed on several occasions orchids growing in trees. In one tree a small orchid species was growing and it had a lot of flower buds. We decided to try to come back the next weekend, so I could hopefully take some pictures of the flowers. After some more walking it was clear that we were reaching the town of San Marcos León; when I climbed a hill I could see a soccer field. We decided to walk back the way we had come. Primo Verdad, Coatepec. In the distance the "snake hill" Coatepec is named after. After 45 minutes of walking we where back in Coatepec. The sky was slowly getting more and more dark. The stand that was selling grilled chicken was gone, so we had to prepare us some food at home. 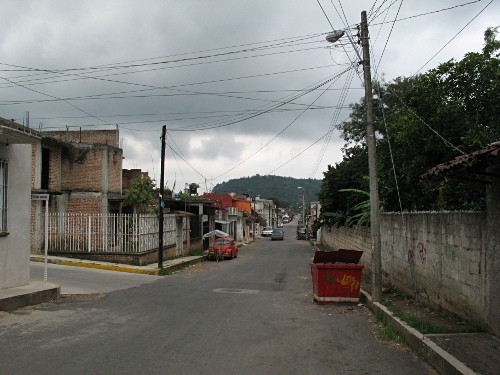 When we were walking down the Primo Verdad I took a picture of the road that would bring us back to our house, with the "snake hill" after which Coatepec is named - Nahuatl coatl, serpent and tepetl, hill - in the background. And soon after we were back in our house and greeted by our little kitten.